This article is about the 2016 Hindi film. For the 1984 Telugu film, see Rustum. Rustom is a 2016 Indian crime thriller film written by Vipul K. Rawal, directed by Tinu Suresh Desai and produced by Neeraj Pandey. Starring Akshay Kumar and Ileana D'Cruz in the lead roles. The film is loosely based on the real life incident of Naval Officer K. M. Nanavati and businessman Prem Ahuja. Principal photography of the film was commenced in February 2016 and it was released on 12 August 2016. Akshay Kumar received the National Film Award for Best Actor at the 64th National Film Awards for his performance in the film. The story dates back to the late 1950s and revolves around a Parsi Indian Naval Officer Rustom Pavri (Akshay Kumar), who is happily married to Cynthia Pavri (Ileana D'Cruz). Their marriage hits the rocks when Rustom discovers about his wife's affair with his friend Vikram Makhija (Arjan Bajwa). After returning early from his ship's deployment, Rustom discovers Vikram's love letters in Cynthia's cupboard. While trying to find her, Rustom sees them together. He returns home and waits for Cynthia to return and then confronts her with the love letters, but walks away before Cynthia can explain. Rustom then gets himself a pistol from the Naval Ship's Armory and makes a Trunk call to Defence HQ, New Delhi. Afterwards, he searches for Vikram, first in his office and then at his home. After Rustom enters Vikram's bedroom, the servant hears three gun shots and rushes to the room, to discover Vikram's body in a pool of blood and Rustom walking away with the pistol in his hand. Rustom immediately surrenders to the police and Inspector Vincent Lobo (Pavan Malhotra) starts the investigation. Vikram's sister Priti Makhija (Esha Gupta) meets with public prosecutor, Lakshman Khangani (Sachin Khedekar) to get Rustom the toughest punishment possible. Truth, a local newspaper, publishes the news adding some spice to it, which creates a stir in the city. On the one side the Navy supports its officer and asks the police to hand over his custody to them while on the other side the Parsi community offers help by hiring a good defense lawyer. Rustom refuses everybody's help and decides to fight the case on his own and prefers police custody. 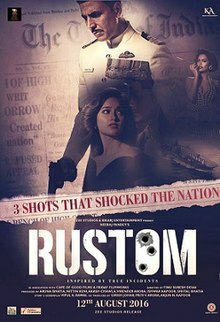 While the Editor in Chief of Truth, Erich Billimoria (Kumud Mishra), creates a sympathetic image for Rustom in public, Rustom's senior Naval officer Rear Admiral Prashant Kamat (Parmeet Sethi) sends two goons to his house to search for a set of documents, but they fail to find anything. Scared, Cynthia rushes to jail to inform Rustom, who hasn't talked to her ever since he is in custody. Rustom finally meets and listens to Cynthia's story, about how she was lonely and upset when Rustom went away to London for many months. With the connivance of Priti, Vikram took advantage of Cynthia's loneliness and she fell for him. However, on the day of Vikram's murder, Cynthia had already broken-up with him for the sake of her marriage after she found out he had deceived her. Vikram couldn't bear her spurning him and slapped her hard. She got injured and walked out of Vikram's house. On Rustom's instructions, Cynthia blackmails Rear Admiral Prashant Kamat for Rs 5 crore in exchange for the vital documents he needed. In the court hearing, Rustom unexpectedly pleads not guilty in front of the Judge Patel (Anang Desai), which leads to a 9-member jury trial. At the culmination of the trial, Rustom is found not guilty by the jury since he shot Vikram in self-defence. Meanwhile, it is found that Vincent Lobo was in Delhi and he had met the office secretary of the Ministry of Defence to obtain the recording of the trunk call that Rustom had made. When back in Bombay, the trunk call is played, convincing almost everyone that Rustom is guilty, and the court proceedings end for the jury to decide on their opinion. In the police station on the night of the court proceeding, Rustom tells Vincent Lobo the truth: he was posted in London for several months inspecting an aircraft carrier that the Navy wants to purchase, but on inspection, it was found by Rustom that the carrier's hull was corroded, and it would have to be repaired and modified before the carrier could be transferred to India. Vikram was in charge of the aircraft carrier, and he attempted to bribe him in order to convince him to say that the carrier is seaworthy. When Rustom attempted to notify the defence secretary in London, the secretary also attempted to bribe him and get the carrier to India. Vikram attempted to persuade him and Rustom then slapped him showing his power of his uniform. The next day it is shown that Rustom is proved not guilty by the jury and he walks free. Then it is shown in the flashback that Vikram had dated Cynthia to show Rustom his power of money and take revenge on him, but not for her beauty. Lobo is told that Rustom did not reveal about the aircraft carrier as then everyone would think the navy to be corrupt and then not believe in them just because of few officers. Rustom and Cynthia walk out of the court with their heads held up high and then the film rolls into the credits, showing the couple settled in Canada. In the end it is shown that after Rustom's trial, the jury system is abolished in India. And also Defence Secretary K. G. Bakshi committed suicide by shooting himself on INS Vishal unexpectedly. Also, the news shows India being the 4th nation to acquire a navy carrier. The Rustom production filmed on location in Kent in April 2016 for the romantic montage where Rustom (Akshay Kumar) and Cynthia (Ileana D'Cruz) visit England including The Chequers Inn pub in Aylesford, Canterbury, Maidstone, Leeds Castle, Dover seafront and South Foreland Lighthouse. The Historic Dockyard Chatham also features for the naval port and ship scenes. The film was released alongside Mohenjo Daro on 2017 screens across India on August 12, 2016. Rustom collected approximately ₹14.11 crore on its opening day. The film collected ₹50 crore in its opening weekend and ₹90.9 crore in its first week in India. The film also performed well internationally, grossing approximately $3 million in its opening weekend. The film score was composed by Surinder Sodhi. The songs featured in Rustom were composed by Arko Pravo Mukherjee, Raghav Sachar, Ankit Tiwari, and Jeet Gannguli, with lyrics written by Manoj Muntashir. The first song from the film's soundtrack album, "Tere Sang Yaara", sung by Atif Aslam and composed by Mukherjee was released on 6 July 2016. The second track of the film, titled "Rustom Vahi" was released on 13 July 2016. All lyrics are penned by Manoj Muntashir. The full music album was released on 14 July 2016. All lyrics written by Manoj Muntashir. ^ "Rustom box office day 4 collection: Akshay Kumar film among highest opening weekend grossers of 2016". indianexpress.com. 15 August 2016. Retrieved 25 August 2016. ^ "Box Office: Worldwide collections of Akshay Kumar's Rustom". bollywoodhungama.com. Retrieved 17 October 2016. ^ "Akshay Kumar begins 'Rustom' with a strong ensemble cast"
^ "Rustom poster: Akshay Kumar playing 'honourable murderer' Nanavati?". 3 March 2016. ^ "Rustom: The real story that inspired the Akshay starrer film". 30 June 2016. ^ Hungama, Bollywood (6 February 2016). "Akshay Kumar and Neeraj Pandey's Rustom goes on floor - Bollywood Hungama". Retrieved 26 October 2016. ^ "First look of Akshay Kumar's 'Rustom' revealed". The Economic Times. IANS. 3 March 2016. Retrieved 8 May 2016. ^ Kent Film Office. "Kent Film Office Rustom Article". ^ a b "Rustom box office day 4 collection: Akshay Kumar film among highest opening weekend grossers of 2016". The Indian Express. Retrieved 16 August 2016. ^ "Rustom box office day 7 collection: Akshay Kumar film to cross Rs 100 crore this weekend". indianexpress.com. 19 August 2016. Retrieved 25 August 2016. ^ Koimoi. "Rustom: Opening Weekend Overseas Box Office Collections". Koimoi. Retrieved 16 August 2016. ^ "Tere Sang Yaara (Rustom) by Atif Aslam on iTunes". iTunes Store. Retrieved 8 July 2016.